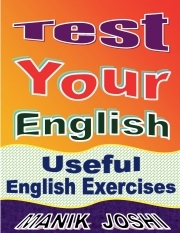 Description of "Test Your English: Useful English Exercises (eBook)"
Manik Joshi, the author of this book was born on Jan 26, 1979 at Ranikhet and is permanent resident of Haldwani, Kumaon zone of India. He is an Internet Marketer by profession. He is interested in domaining (business of buying and selling domain names), web designing (creating websites), and various online jobs (including 'self-publishing'). He is science graduate with ZBC (zoology, botany, and chemistry) subjects. He is also an MBA (with specialization in marketing). He has done three diploma courses in computer too. ManikJoshi.com is the personal website of the author. Reviews of "Test Your English: Useful English Exercises (eBook)"